Category: Bath & Body, Skin Care. Tags: chapstick, lip balm, natural chapstick, natural lip balm, organic chapstick, organic lip balm. 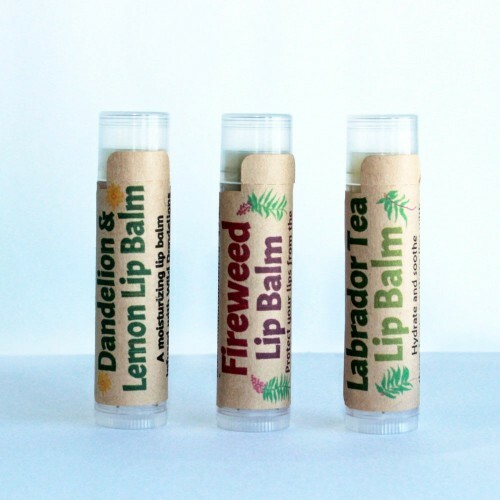 Treat your lips with a variety pack of 4 Natural Lip Balms! Handmade with wildcrafted herbs from Canada’s Northern wilderness, complemented with organic oils and butters such as Jojoba and Shea butter. If your spending a day under the Midnight Sun or spending the afternoon enjoying the winter snow these lips balms will help protect your lips from the elements. A perfect lip balm! It feels lovely going on and I also love that I can cover my kids lips in them, to help ward off the cold weather, and I don’t have to worry at all about what they are ingesting as they inevitably lick half of it off! Thanks for a great priced, great product! I love all of these. Since I tried my first one years ago, I haven’t purchased anything else. Very smooth but lasts.